The Falcons and Saints go back a long way. The teams have been archrivals since the Saints began playing football in 1967, a year after their neighbors from Georgia had already played a season. There are many rivalries in the NFL, but perhaps no other has been as competitive and consistently heated as Falcons-Saints. Sure, neither team did much in their first few years in the League, but they still had the rivalry. While being eliminated from playoff contention halfway through the season was normal in the early days, Atlanta and New Orleans had each other to look forward to, games in which each team bussed fans in for the road games and typically drew large, spirited crowds. This year is the first since 1981 that the Falcons have hosted New Orleans in the season-opener. While the Birds have travelled to New Orleans to open the season multiple times (and also were the unlucky team selected to play at New Orleans in the Saints’ first game back in the Super Dome after Hurricane Katrina in 2006), Atlanta has waited quite some time to get its arch rival at home in Week 1. In addition to the obvious emotional aspect at stake in this game, there is also the mathematical angle. The Falcons and Saints have combined to win four of the last five division titles and each team comes into the 2014 season as threats to win it again. Regardless of who the Falcons are playing, Atlanta fans are just glad they are opening at home for a change. Smith’s teams have kicked off the regular season in Atlanta just twice in his tenure in Atlanta, which began in 2008. In fact, the past four seasons have seen the Falcons travel for the season-opener. Opening at home will be a relief for the Falcons, according to Smith. In Smith’s first two years in Atlanta, the Falcons beat Detroit and Miami in season-openers at home. They haven’t opened a season in the Georgia Dome since. The Saints affair is just the second time the Falcons have ever hosted New Orleans to open the season. The other was the 1981 game, a 27-0 Falcons win in what was an NFC West game at the time. Despite only hosting New Orleans once in an opener, the Falcons have traveled to the Pelican State to open the season six times. 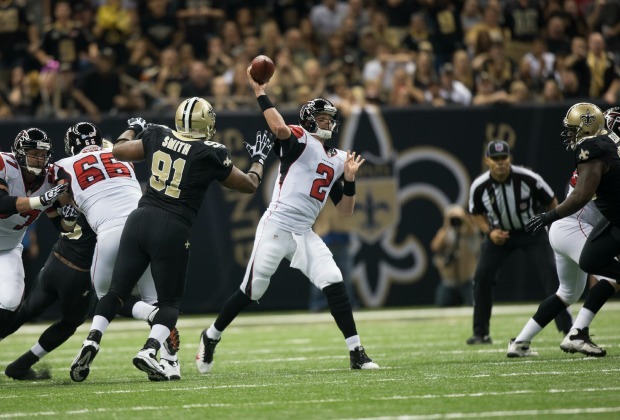 Last season’s 23-17 defeat was the Falcons’ first-ever loss to the Saints in seven total season-openers. Atlanta leads the all-time series 46-43 despite a recent slow period. The southeastern neighbors were actually in different divisions when New Orleans came into the League in 1967, and that lasted until 1970 when the two moved into the NFC West. Previously, Atlanta had been in the Coastal Division and New Orleans in the Capitol. After being largely dominated in the early years of the rivalry, New Orleans swung things in its favor from the mid-80s to the mid-90s. But the Falcons would restore order with a 10-game winning streak that spanned from 1995-1999. The opener against New Orleans is one of the most anticipated regular-season games in Falcons franchise history. Atlanta sports fans count the Saints as one of their most hated teams in all of sports. Add the Saints’ recent success against Atlanta and you have the recipe for a cauldron of emotion awaiting New Orleans on Sept. 7.